Euro 2008 is officially underway after Switzerland and the Czech Republic opened up the tournament followed by Portugal and Turkey taking each other on. Karel Bruckner's men edged out the host nations in a 1-0 win with a 71st minute goal by Sverkos, a rather unfortunate defeat for the Swiss after they were the more livelier team. While later in the evening Portugal had a frustrating evening after hitting the woodwork 3 times but they eventually found the lead after Pepe found the back of the net the second time after his first goal was ruled offside. And just before full-time Meireles scored his first international goal to seal the deal for Portugal. But it's Italy that the attention is being focused on after the World Champions have a lot to live up to in their first tournament after triumphing in Germany two-years-ago. 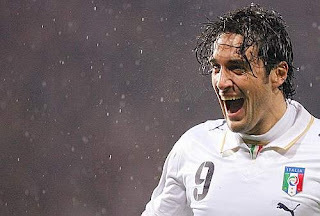 The build-up to the Euro was filled with plenty of injury scares, unfortunately for Italy only one player cannot make it to the Euro but he will nevertheless be as inspirational as ever. Captain Fabio Cannavaro suffered a knee injury during a training ground practise where Giorgio Chiellini went in for a tackle forcing the Real Madrid player to be carried off immediately. Following tests and a successful operation, Fiorentina's Gamberini was called in to replace the former World Player of the Year but he will; nevertheless, remain with the Azzurri throughout the whole tournament. Tomorrow the Azzurri will take on the Netherlands in a game that promises great football. The winner of this tie will no doubt be in the front seat to qualify as they face two other tough teams in the "Group of Death". Van Basten and Donadoni have it all to play for and they certainly want to outwit each other as the two former Milan legends and teammates face each other in a tactical battle on the field. While it might be a great rivalry on the field the two friends have the utmost respect for each other off the field. It is time for the Azzurri to rekindle that fire from Germany 06 and find the passion and determination that has seen them work so cohesively over the past few years. No doubt we will see some fantastic Gigi Buffon saves, perfectly timed tackles from Zambrotta and Barzagli, grinta from Materazzi and Gattuso, perfectly placed balls from De Rossi and Pirlo and the goals by Toni and Di Natale. This will surely be a memorable tournament for the Azzurri if all goes well. A total disaster, hope it gets better on Friday night!